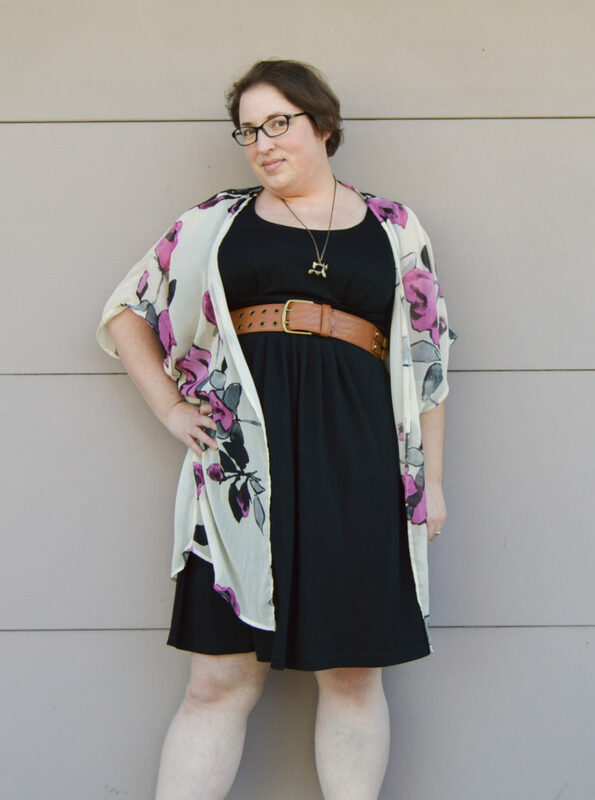 Today I am joining in on the fun of the Where to Wear series that Katy of Wild and Wonderful and Angelica of Gardening in High Heels are hosting. In this series they are pitting sewing bloggers up against fashion bloggers with different everyday scenarios that we are to dress ourselves for. Today’s theme is outdoor festival. I am so excited to share my makes with all of you! Now, I am not one to attend music festivals like Coachella and Bonaroo. Heck, I don’t even think I want to go to Burning Man. It is just not my scene and it is too hot! All that being said I love the wild child boho fashion that goes along with those festivals. I am more inclined to go to a local festival like the Elkhart Jazz Fest or a movie night here in town. I knew I wanted to translate that free-spirited fashion into a upscale look that fits the festivals I want to attend and this is the result. I started with my little black dress, McCall’s 6073, that I made last year at this time. It really is the perfect knit dress for me. To capture that airy flowy boho style I knew a floral chiffon was the fabric I wanted to use. I have several to choose from but this is the one I settled upon. I picked it up last year at Zinck’s Fabrics for $2.99 a yard. It is a lovely airy crinkle chiffon with gold threads woven in and a romantic watercolor floral print. 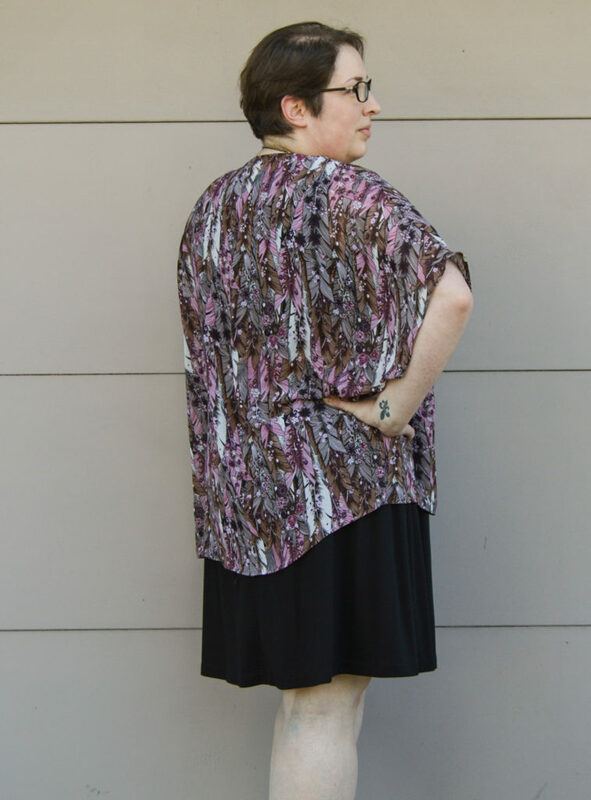 I ended up using 1.5 yards of this stashed chiffon for my self drafted kimono cardigan. For this version I added 10″ in length. I love this longer version. It is a great length to go with dresses for a more dressy look, but it also pairs perfectly with shorts and a tank top for a more casual look. I accessorized by adding one of my favorite tan belts and my vintage sewing machine necklace to complete the look. I am really going to enjoy wearing this outfit this summer. 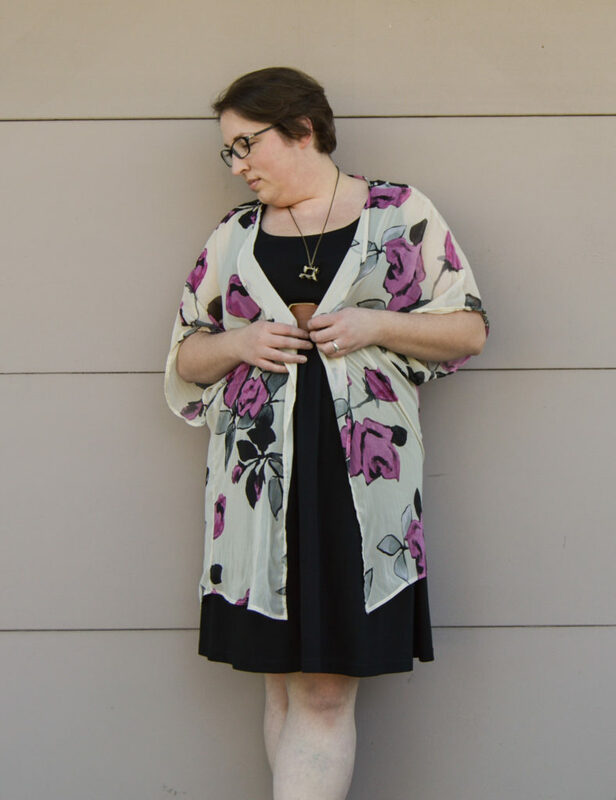 For an even more boho look, this is my original short kimono cardigan I made last summer. I used a feather and floral printed chiffon for it. I love this short version paired with shorts or jeans over the black dress. I would love to release both versions of this pattern to all you wonderful sewists! I know you all can come up with some great versions. I need some help to do that though. I need someone who can take my digital pattern and turn it into a downloadable PDF. Any takers or leads on who could do that? 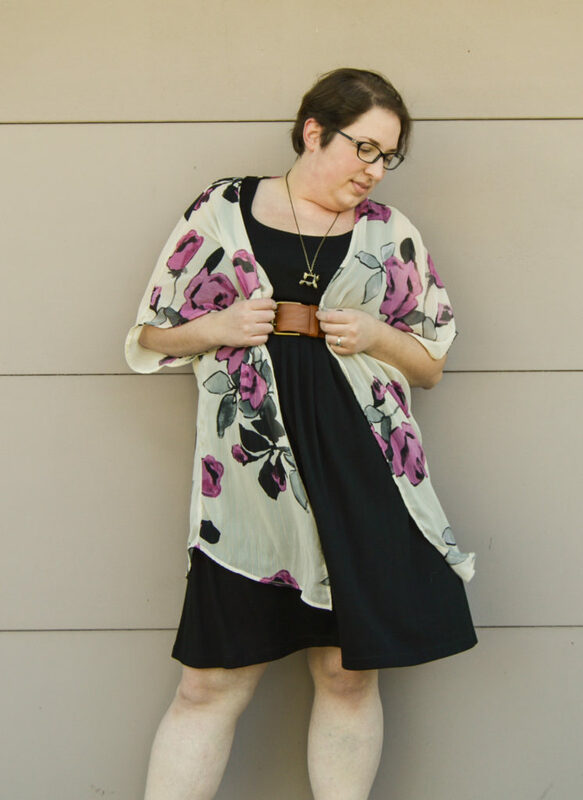 This entry was posted in Sewing and tagged boho, chiffon, feathers, floral, free spirit, kimono cardigan, McCall's 6073, self drafted kimono cardigan, Wear to Where. Bookmark the permalink. 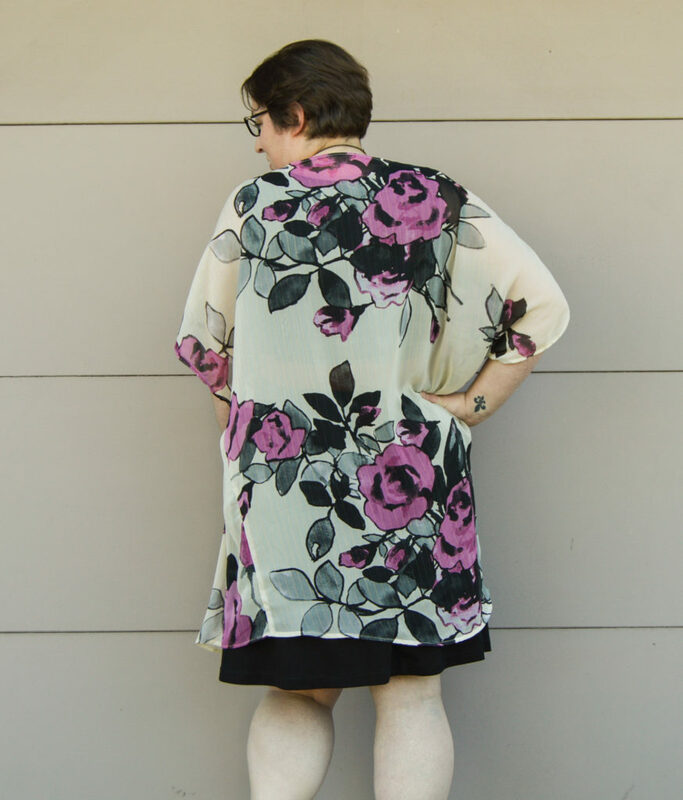 That big floral print on your first kimono is giving me all sorts of heart eyes! 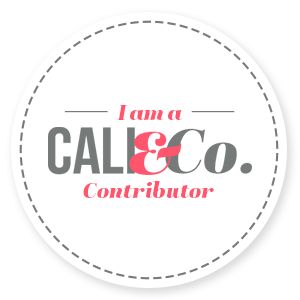 I can’t think off the top of my head who converts paper into pds for you…but I know there are some designers out there that will. Let me think on it! Haha! Thanks! I am really looking for someone to take my digital DXF files and convert them in Illustrator. Thanks! I still have a 1.5 yards left. I may have to host a giveaway for it! I love your outfit choices! And I love Zinck’s. It’s been way too long since my last trip out there (It’s about an hour for me) but I need to go soon. Thanks! I go to the Zinck’s in Ligonier, IN. It opened about 2 years ago I think. I really like it and I posted a review about it here. The longer line kimono really is so beautiful! I agree with you – it does dress up the outfit. I love how it flows so nicely. Gorgeous! Thanks! I really want to make another long version soon. Maybe add some fringe. The fabric that you chose for the kimono is so perfectly wild child with a touch of elegance. And self-drafted too?? I’m impressed! With the black dress and the pop of accessories, it’s a perfect statement. Nailed it! Both of your kimonos are absolutely beautiful, they look great paired with your black dress and belt! I’m not much of a sewer, but seeing this makes me want to bust out the sewing machine. 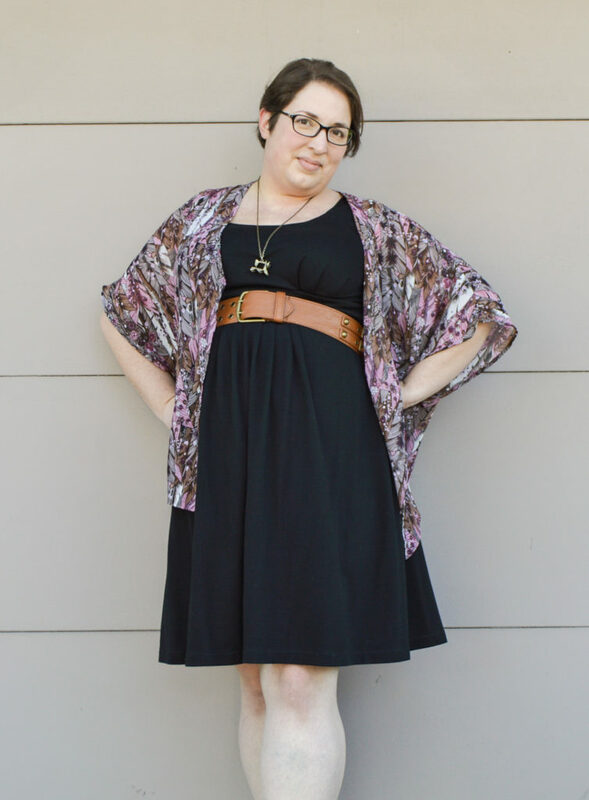 Ooo…and I agree with your response above, a fringe kimono would be fantastic! Thanks! I am working to get this pattern into a downloadable PDF, so you will definitely have to pull out your machine!! Lovely! I love the boho styles, but I also like that this one is everyday wearable.